Thanksgiving has been a great holiday for the church to spread the message of Christ. 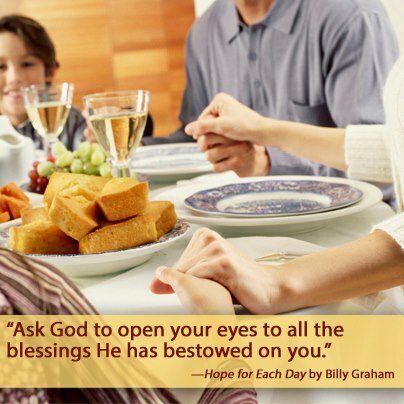 After all, the feast between the Pilgrims and the Native Americans was to give thanks to God for his provisions. The stated purpose of the Thanksgiving holiday was to thank “our beneficial Father.” But has our approach to Thanksgiving been lost somewhere between the stuffing and the cranberry sauce? Is there a way to find a Biblical model for Thanksgiving? A search of the scripture yields four important principles that are contained in a Biblical model for Thanksgiving. These four principles are by no means a complete list, but they stand as a good beginning to enjoying a Biblical Thanksgiving. Why has the meaning of the Thanksgiving holiday dwindled down to overeating and watching football? The sacrifices that were made to create this holiday happened long ago. We are remembering someone else’s sacrifice and its impact is mostly lost on us. To make a true day of thankfulness to “our beneficial Father” we must focus our own sacrifice. The Old Testament illustrates this principle about Thanksgiving. To give thanks to God always required some sort of sacrifice. In many cases that meant the sacrifice of animals. In other cases, sacrifice included being willing to proclaim the good news. To Jonah, Thanksgiving meant a commitment to pay his debts. Though the vehicle was different, the principle remained the same. To offer thanks meant some sort of personal sacrifice. Nowhere in the scripture is this better modeled than through David. What Has Thankgiving Cost You? As we give thanks to the Lord on the day set aside for national thanksgiving, take time to reflect on your own personal sacrifice to the Lord. What has thanksgiving cost you? What blessings have you received as a result of your sacrifice? The sacrifice may have been time, talents, treasures, or relationships, but a Biblical Model For Thanksgiving is one that has counted the cost for discipleship. Then it matches the cost with God’s blessed rewards. I am bound by Your promise, O God. We know that the one who raised the Lord Jesus from the dead will also raise us with Jesus and present us with you to himself. All this is for your benefit, so that the grace that is reaching more and more people may cause thanksgiving to overflow to the glory of God. In this workaholic, keep up or get trampled world there is precious little time for reflection. For centuries, Sunday was God’s day, a time to slow down. Not so in today’s world. The stores are open, kids sports have chosen Sunday as their time to schedule games. Professional sports call to us Sunday mornings, afternoons and evenings. All the jobs that must be done around the house, take away from our reflection on events that took place generations ago. God wants us to understand the full impact of what He has done for us through the death, burial, and resurrection of Jesus. This is not just a momentary pause but a heartfelt understanding of what the sacrifice of God’s Son has done in our own life. Paul’s instruction to Timothy is powerful. Many consider prayer as their last hope. When they have tried all they know to do, the only thing that’s left is to plead with God. Paul says prayer is the first, and the foremost (most important) activity among God’s people. A sincere reflection of what God has done for us will call us to spend time in prayer with the Lord. Whether we pray alone, with family, or with the corporate body, prayer is the most important principle in a Biblical Model for Thanksgiving. A family that invests in the first three principles will undoubtedly experience the final principle on their own. People are blessed with an innate desire to break into song when they are filled with joy. It is a natural outpouring of people who have spent time with the Lord in prayer. It is the fruit of those who focus on the blessings they have received from the Lord. Singing is a very large part of worship throughout the scripture. Praising God through music is also a central part of corporate worship services today. It should also be a part of our personal and our family worship time. The translation of Psalm 107 quoted below is awesome. Like a volcano that builds pressure until its lava can’t be held back any longer, when God’s people spend time with the Lord, they invariably erupt from their inner being. And all the wonders He has performed for humankind! and tell stories of His great deeds through songs of joy.